We have heard so much bad economic news that most people believe it, even though it is not true.The economy has recovered to the point that the economic stimulus is being ended. That would normally be good news. It is strange that it has not been widely disseminated and many people may be unaware of it. You may read a little piece here and there in the paper about it, but it hasn’t seemed to enter the public’s mind. Actually, since it would help the Democrats, great efforts have been made by some money interests and obstructionists to downplay the recovery. The chart at the right summarizes the recovery in the last five years. 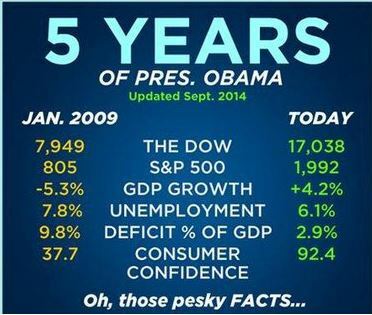 Though it was put together by the Occupy Democrats, the numbers seem to be accurate and can be checked. Normally the President would get credit for the recovery, but not so much in this case as it would likely help the Democrats in the next election. The news could probably have been even better except for the missed opportunities caused by obstructionists in Congress. I hope some of them will join the jobless after the next election. This entry was posted on Sunday, November 2nd, 2014 at 3:29 pm	and is filed under National Politics. You can follow any responses to this entry through the RSS 2.0 feed. You can leave a response, or trackback from your own site.